Feel free to engage with us on any of the platforms shown below, or via email. We'd love to hear from you. Ontologics helps you to gain and sustain competitive advantage today and in tomorrow's digital world. From business strategies for ICT, to portfolio optimisation, organisational design, business and enterprise architecture establishment and operation, including various offerings as turn-key capabilities or services, Ontologics can position you for success. We are a group of outcome driven business and technology professionals, passionate about optimising and sustaining enterprises. Sometimes transformation isn't enough; if you need sustainable competitive advantage with a short return on investment without compromising on the strategic plan, Ontologics can help - quickly. We deliver services, outcomes and experiences that help businesses become and remain sustainable, through structure, clarity, analytics, and insights. Can you describe your organisation consistently, in terms of PESTEL, including org structure, functions, processes, applications, information, etc? Can you articulate the current state of the organisation, the future state required and how the transitions along the way will get you there? Do you have the basic tools, information and capabilities to plan and run your business well? We can help you build, run and maintain the tools, processes and information to make this simple. Do you have the ability to compare your enterprise to the market, form executable strategy, assess against industry standards and audit requirements? Can you quantify your business continuity position? Is your strategy and operational plan effective? Are your people spending time on the most important things? How do you know? Ontologics can provide turn-key capabilities for your team, or provide ongoing services to simplify and streamline these capabilities. Do you have the capability to compare multiple years of performance data against benchmarks? Can you model what-if scenarios for your business strategy, structure, operation and transformation programmes? Can you provide consistent, tailored and compelling views of all these things to the board, the executive, management and your teams? Ontologics can assist you with putting the mechanisms in place, training your people, and operating the platforms to analyse your business. Can you quantiatively define, select, justify and deliver investments and benefits on the best opportunities for your business at any point in time? Are you able to innovate in an agile and timely fashion? Do your people have the tools and information required to make fast, accurate, justifiable decisions? Ontologics can help you put standard, repeatable mechanisms in place that enable you to stay ahead of your competitors. We have everything you need to start strategising, planning, operating and transforming efficiently and effectively. Across all of our Core Services Lines, shown below, Ontologics have a vast array of tried, tested and validated collateral which allows us to take a structured, repeatable approach. We are not inventing templates on your time - they exist now. We can come in, use these tested processes and templates, and deliver value and results from day 1. More than just another consultancy. For us, it's all about the relationships, so you choose the delivery approach that works best for you: Ongoing managed services, outcome-based engagements, turn-key capability delivery for your teams, or time and materials. 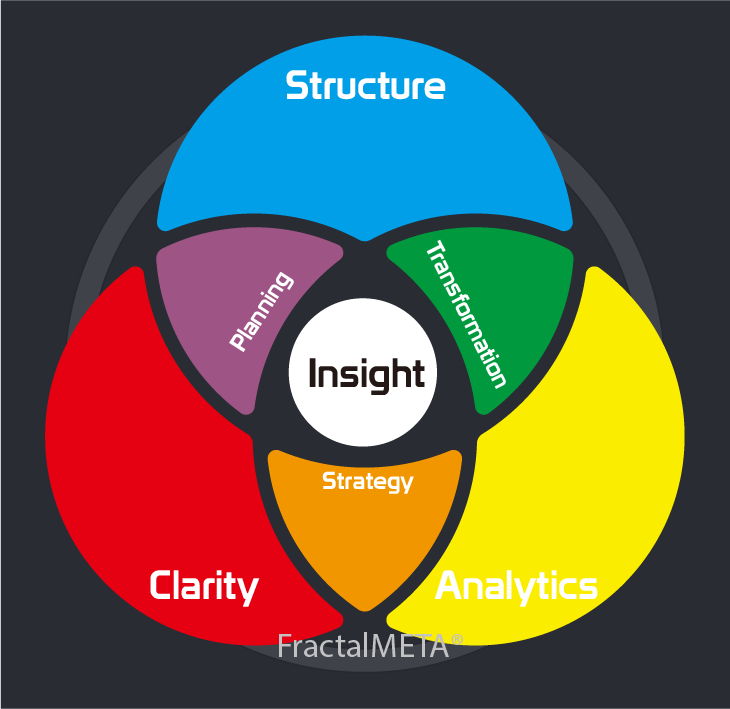 Our Trademarked framework, FractalMETA®, utilises the 4 step C.A.S.T. method; we start where it makes sense based on your organization. You won't necessarily need or want to start at 1. Reach out to discuss how an introductory Insight Session can start saving you money and time today. For every dollar you spend with us, we can typically identify and help you deliver opportunities and savings between two and twenty-five times your investment, delivering real value in the first month, as part of a simple 4 step approach to real enterprise sustainability. Assessment - Once the issue has been acknowledged, how big a problem is it? We have assessment tools from 20,000 foot view down to detailed COBIT framework alignment and ITIL maturity assessment that allow you to quantify specifically how big an issue is - so you can target the right areas to fix and also know which area's will give you the greatest return on investment (in time/money/people) by addressing. Structure - Industry standard organizational structure, who does what, reports to whom, what should the KPIs be for each role, how should they be measured, how often? What should we have in our service catalogue, what process flows should we use? We take our templates, work with you to align them to your organizations requirements and roll out. Transformation, ready to run project plans we can drop sections from / add to as required for your organization to transform from where you are to where you need to be. Tailored to provide the biggest gains soonest within the unique skillset, maturity and cultural context of your organization. Recommended management checkpoint intervals, recommended measures - ready to drop into your managers and team leader's hands.